Today's e-marketplace perpetually demands more and more just to have your business noticed. Having a professionally designed site doesn't mean just giving your site greater visual appeal. It is also critical to have enhanced functionality, dynamic content, and W3C (World Wide Web Consortium) compliant coding to ensure that your site will be properly crawled by web-spiders: GoogleBot, Slurp, Windows Live, MSN Spider, Ask Spider, etc for better indexing on search engines and web directories. Vautour Design Studio will develop an affordable interactive website for your organization that is clean, compelling, search engine friendly, and cost-effective. We also offer redesign services as well as PHP and ASP web development services for dynamic sites and e-commerce sites. 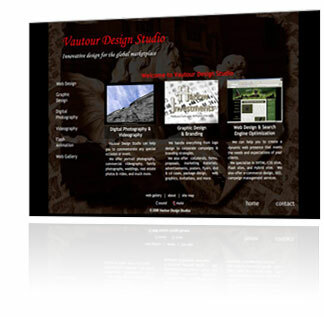 All sites developed by Vautour Design Studio include a basic search engine optimization. Most design and development firms charge an additional fee for this service. However, we feel that dropping a client on the web without at least a basic search engine optimization is the equivalent of dropping someone in the middle of the ocean in a boat that has no oars, sails, or a motor. We refuse to do this to our clients. This may seem a somewhat colorful analogy but it is nonetheless an accurate depiction of having your website on the web without it being adequately prepared to be found by the search engines. SEO is vital to your online success! Struggling with budget constraints? Check out our website templates page! is the leading authority on web standards & best practices.